When we moved in to our new house last year, the holidays were just starting. 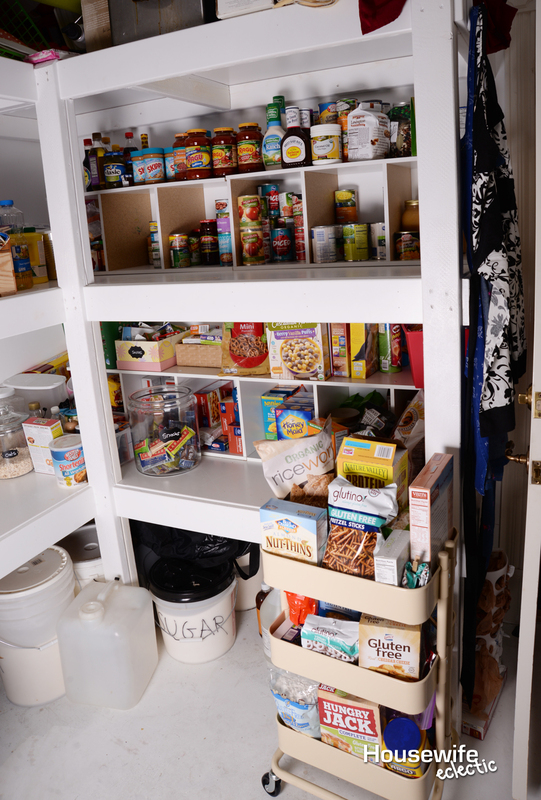 I dumped everything in my pantry and called it good for a long time…. too long. With everything that was going on around the holidays, I didn’t think I had time to focus on cleaning up the pantry. If only I had realized just how much time I was going to waste looking for things, I might have cleaned it up sooner. At the beginning of the year I was diagnosed with a chronic illness and it was just the kick in the pants I needed to change my life and our food habits around. I pulled literally everything out of pantry and started fresh with blank shelves. I needed to change what I was eating and quick. Starting over in the pantry was the most helpful thing I did for my lifestyle changes. I not only organized it to make food easier to find, but I got rid of a lot of the junky food to make it easier to eat better. Look how bad it was! Yikes! I have a lot of space in my pantry, which helps keep my teeny tiny kitchen organized, but the big problem was that I had a ton of vertical space and no real way to use it. I needed something to break up the space so I could use more of it. I found some closet organizers and laid them on their side and it was absolutely perfect. It cut my shelves in half, giving me enough space to put things on top and the cubes inside allowed me to stack cans without being scared they were going to fall. The cubes let me even stack cans that don’t normally stack well. It also let me separate food by food groups to make them easier to find. I have fruits in one cube, vegetables in another, tomatoes in a third and beans in a fourth. It makes it so easy to go and grab right what you are looking for. 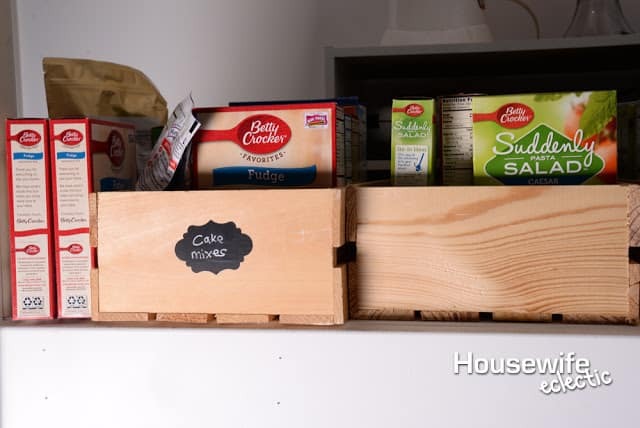 On my bottom shelf my cubes hold snacks and pastas. One of the first things I did was go through all of our food. I eat gluten-free and refined sugar free but my family doesn’t necessarily. 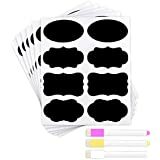 I wanted to get rid of a lot of the junk we were eating, but I didn’t want my family to feel deprived and like I was taking all of their favorites away from them. We switched most of the kids snack foods to Annie’s products like their bunnies and fruit snacks to make it a seamless transition. I also discovered a love for guacamole chips. Delicious! I discovered Annie’s makes a fantastic mac and cheese and my kids go crazy for Larabars, finding foods that my kids loved that weren’t full of their normal junk made the transition easier. I keep one large jar of snacks on the shelf. It doesn’t have a lid because the kids had a hard time pulling the lid off. It is full of snacks that the kids don’t have to ask before they eat. 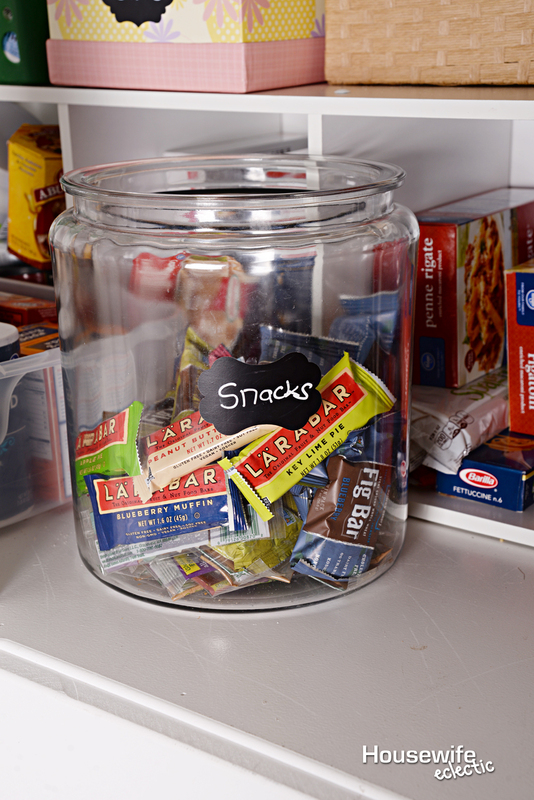 It really helps to have a jar of snacks that they can just walk in a grab one. 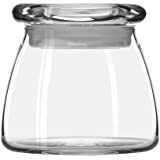 It is usually full of squeezable applesauces and Larabars. I have found that half crates work the best for items like cake mixes and boxed dinners. It keeps them all together and tidy on the shelf. I think my baking shelf might be one of my favorite things ever. 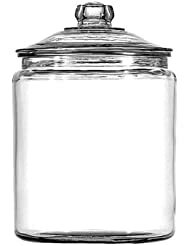 Each of my baking items are kept in a jar to make for easy finding and cooking. 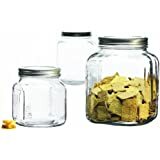 I keep flour, sugar, whole wheat flour, brown sugar, Italian Dressing Mix, Ranch Dress Mix, couscous, powdered sugar, corn meal, oats, rice, brown rice and a cream soup replacement in my jars. I placed a chalkboard label on each jar and then used a chalk marker to mark each jar. I also keep a couple of carts in my pantry, one is a lunch cart that my daughter uses to make her own lunch for school and one is a gluten-free cart. 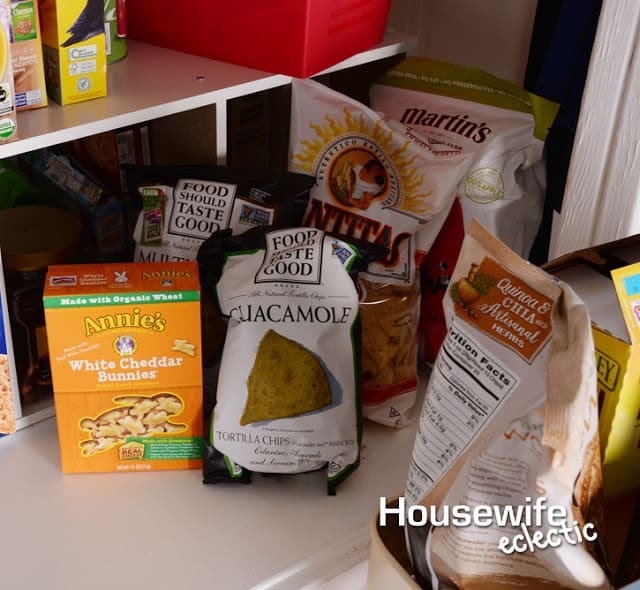 I don’t necessarily keep everything gluten-free in my pantry on the cart, but it is where I keep gluten-free things that aren’t meant to be consumed by the entire family. Cleaning up my pantry has changed our lives. In a time sense, we are able to find things quicker and life doesn’t feel quite so chaotic, but our health is also better. The first week I went gluten-free, I came home from the grocery store in tears. It was so hard to find things I could eat and I was starving all the time. A friend suggested checking out Sprouts and it seriously was like walking into heaven. There were so many things that I could eat and so many things that I wanted my gluten eating family to eat too. Sprouts makes it so much easier to find those foods. 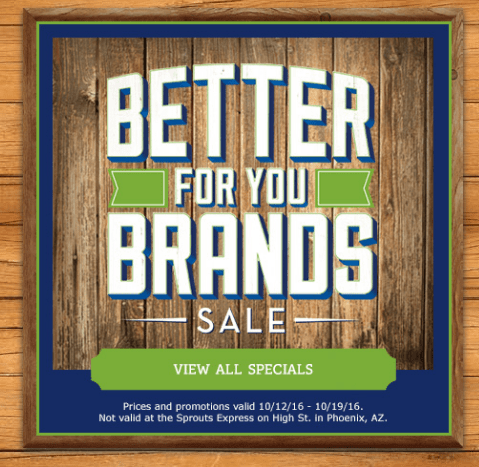 Right now at Sprouts, you can save big on Better For You Brands. 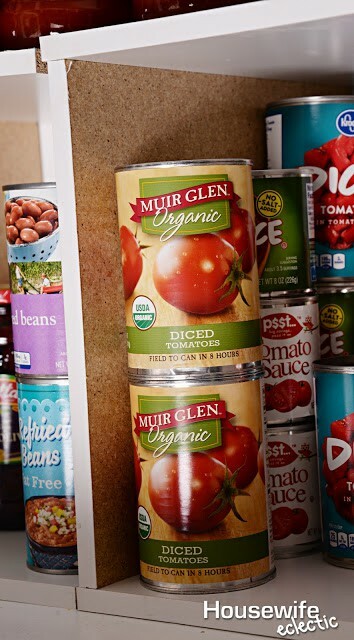 Brands like Annie’s, Larabar, Cascadian Farms Organic and Muir Glen are all on sale for 35% off. It is the perfect time to stock up on good food and organize your pantry to set yourself up for better eating this holiday season. The sale runs from Oct. 12-19th 2016 . You can find more about the sale here. I love those cubes! I showed this to my husband and he said it was a great idea. 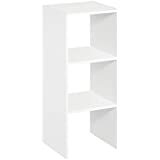 I told him we should just get an old bookshelf and just chop it up to put in our pantry. Thanks for the idea! 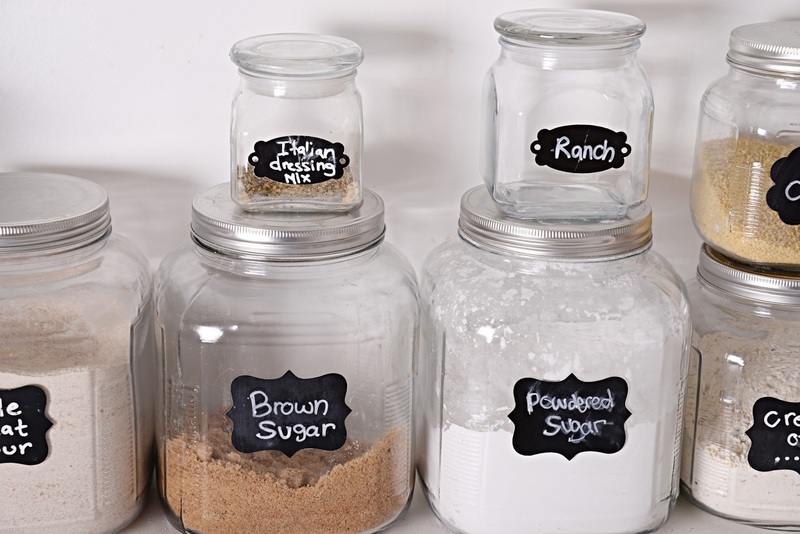 Love the labels and jars you used. So cute! I love the transformation! I don't have a pantry, but I need to organize my cupboards whenever I find the opportunity. Pantries. My husband and I spent a day this summer organizing our pantry and now it is right back where we started. Yikes. 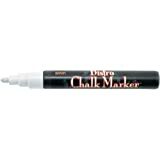 I love the chalk labels. I wish I had pantry space in this house. I do love the ideas you have shared. I currently use jars in the cupboards. Great job on all of that reorganizing!! Really impressive! 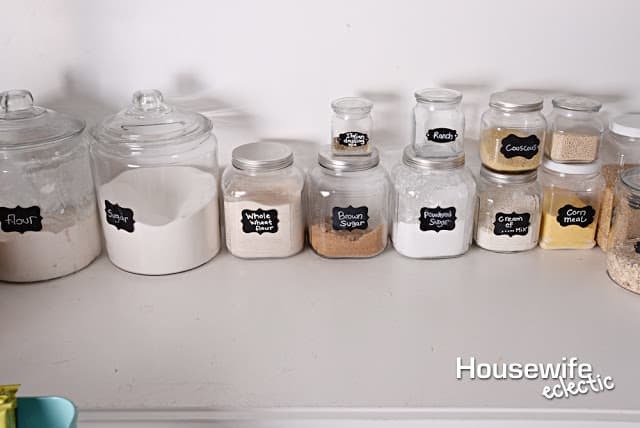 I especially like the glass jars with chalk labels. So cute! love and hated that you posted this! 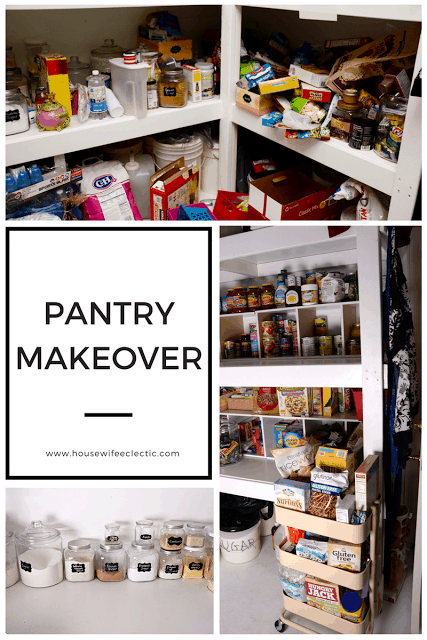 now I HAVE to redo my pantry lol! What a great job you did organizing!! I love the jars with the chalk written labels that's so handy you can switch up what's inside easily! De-cluttering makes you feel so much better! Right now we live in a teeny tiny apartment and do not have a pantry but one day we will move into a house and I am totally taking that chalkboard jar idea. How clever is that?! I love it! This is a great idea, we have a lot of counter and pantry space, but I wonder just how much we shouldn't have out there. We're trying to eat out less and eat in more, with healthier option, so thank you for the brainstorming starter. 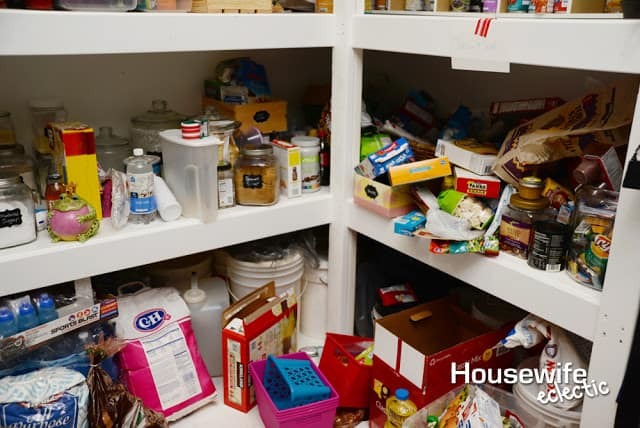 I think it's amazing that you decided to clean the pantry up, it's easier to keep track of what you're eating when you can see everything that you have in the kitchen or in the pantry! I love how it turned out! Everything looks great. Wow what a great improvement! Sometimes its really good to get down in the nitty gritty and clean and organize everything. I just redid my pantry and it looks nothing like this. Super job getting that pantry back in shape! I love how you were so clever with the closet organizers. It looks fantastic. We are trying to eat healthier and I agree when you can see what you have that is much easier to do. Looks beautiful. I feel like this my kitchen is your before picture… lets see if I can make it like your after picture.